Our of our favourite days out as a family is a trip to Greenan Maze, in Co Wicklow. Greenan maze is part of Greenan farm, a very special place that we discovered this summer. Greenan has a farm, a cafe, a playground, a labyrinth and a country life museum and it is less than one hour, in a really beautiful stretch of the Irish countryside. Please note: this review is unsolicited and unbiased and we received no compensation or incentive to write it. Greenan farm is a lovely, welcoming place. The first thing you notice, on arrival, is the quaint cottage that hosts the cafe. 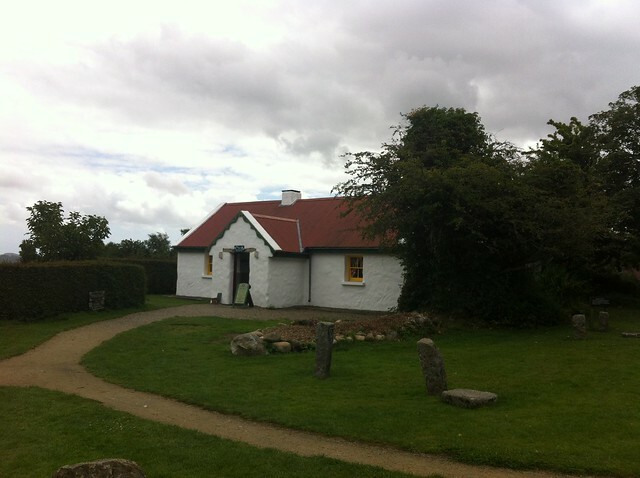 The cottage hosting the cafe’ is made of two rooms: the first has the till with all the cakes and cookies on display, while the second is a long, rectangular space with sloping wooden roof and windows opening onto the country. The cafe is decorated with colourful bunting and handmade curtains and has a familiar, charming and unassuming air. 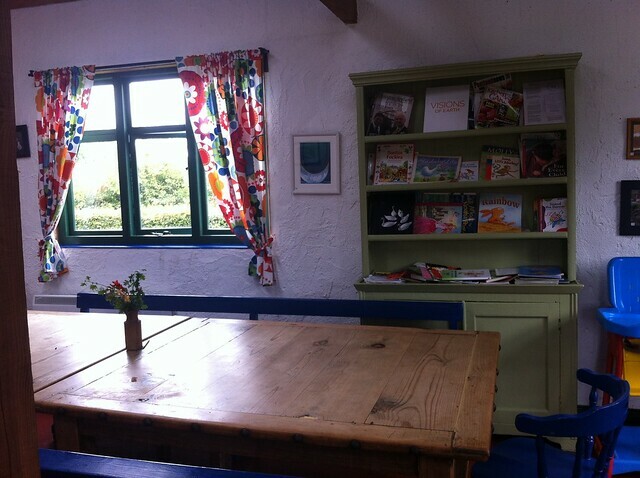 Solid wood tables, a couch and a bookcase full of children books make the place a kids’ paradise and homemade cakes, soups and sandwiches keep all ages happy. 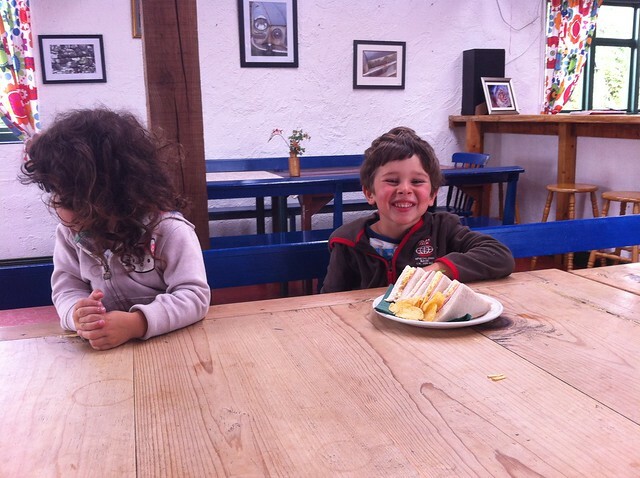 Let’s have lunch in Greenan Farm! The cafe is just at the edge of a wood, crossed by a small path and hiding something special: fairy doors! Magical, small wooden doors blend in with the trees and the leaves opening up, to the attentive observer, the secret world of fairies. The fairy trail is adorable: the kids loved spotting the doors and this nature walk became a nice mix between a leisurely stroll and a treasure hunt: who will spot the next door first? At the end of the trail, the path leads to the small farm area, inhabited by geese and a donkey among others and then to a small, interesting museum, with old photos and impressive farming machines. The most peculiar part of Greenan is Greenan maze: we didn’t notice it when going in (not sure how we missed it! ), but the maze that gives the name to the estate lays just beside the main car park, a small entrance between the hedges inviting in anyone daring enough to enter. The maze is a proper labyrinth with over the head high bushy sides. It is elaborate enough to make you get lost – make sure you enter with sufficient time to find your way out!! The lovely playground just beside the maze restored the good mood for everyone. Greenan maze and farm regularly hosts events for families. We have been many times and we always had great fun, but there is one that stuck in our memories, for all the right reasons: the Greenan Maze Halloween experience! During one of our days out at Greenan, we were told that during the Halloween week, ghosts, dementors and ghouls take over the maze, if you happen to be there when this happens, the only way to escape their touch is to negotiate your way to the centre of the labyrinth, be nice to the wizard inhabiting it and convince him to give you the potion that will protect you from the evil. It sounded too much fun to miss and surely enough we made our way back to Greenan maze on a late October evening. The weather was cold and wet, the darkness so typical of the Irish winter soon menaced to envelope us, but we decided to brave the labyrinth and our courage was rewarded: despite a scary werewolf (who jumped on Dada who got a fright and in turned scared Little Ms E!) we made it to the centre of the labyrinth and drank the magical concoction on offer! It was a fantastic afternoon and an experience we have then recommended to all of our friends of all ages! Need to know: The take part in the haunted labyrinth experience you need to book. Different slots are available and they are suitable for different ages. We found that the one at 4pm was suitable for younger kids but I wouldn’t bring them any later as the lighting and the dark surroundings of the Wicklow countryside do make the place pretty eerie!